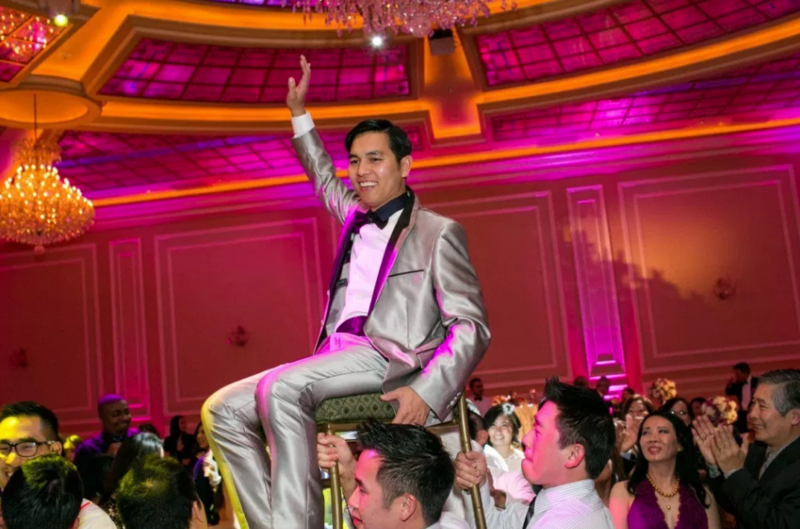 When you’re organizing an event—whether it’s a party, corporate event, or a wedding—one of the most important elements of your planning process is the venue you choose as the setting for your celebration. 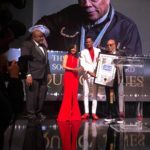 The wrong event space can make or break your event. The ideal venue should include plenty of space, the right atmosphere, and of course, glamorous elements to impress your guests. Variety and versatility in an event space are also important. 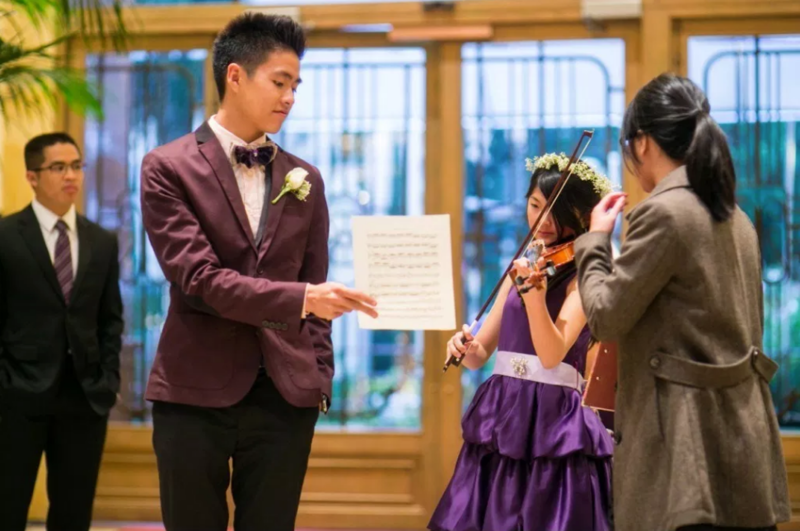 For example, many couples who are looking for the perfect wedding venue want a combination ceremony/reception wedding site so that they and their guests won’t need to travel. Not only this; they also want a comfortable area for their guests to mingle during cocktail hour, as well as a picturesque area for wedding portraits. All of this may sound like a lot, but at Taglyan, we believe that all of these factors are necessary to provide the wedding day vision that most couples have. And we’re here to offer it. Our event space not only includes choices for our clients; everything is also customizable so that we can match the style or theme of your wedding with the right décor, LED lighting, and mood. Let’s begin with our foyer. While we have hosted wedding ceremonies in our beautiful outdoor gardens and our dazzling ballroom, the foyer is also a highly popular place for couples to get married. Its elegance and sophisticated beauty create a romantic environment which set the stage for our couples to have a fantastic life together. For those couples who choose not to get married in the foyer, this area also makes the perfect backdrop for an upscale cocktail hour, with plenty of room for mingling and live music. The foyer is also the ideal spot for guestbook signing. This is one of the most versatile areas of our event space. 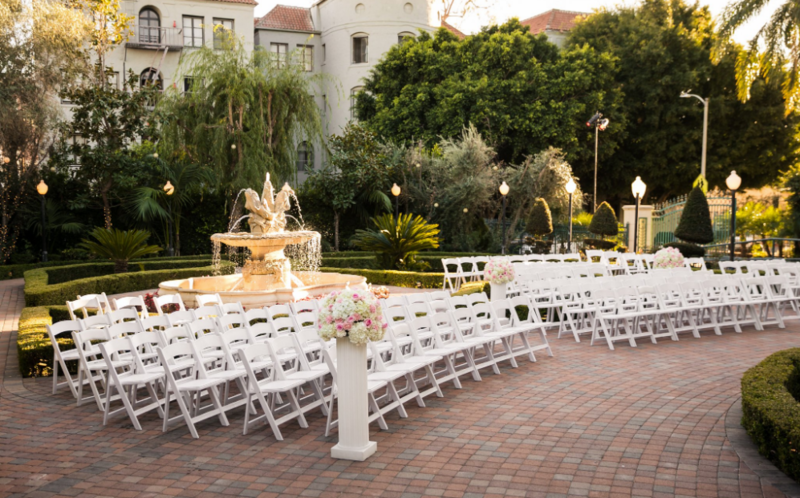 Our Italian-inspired outdoor gardens have also proven to be a beloved choice for wedding ceremonies. 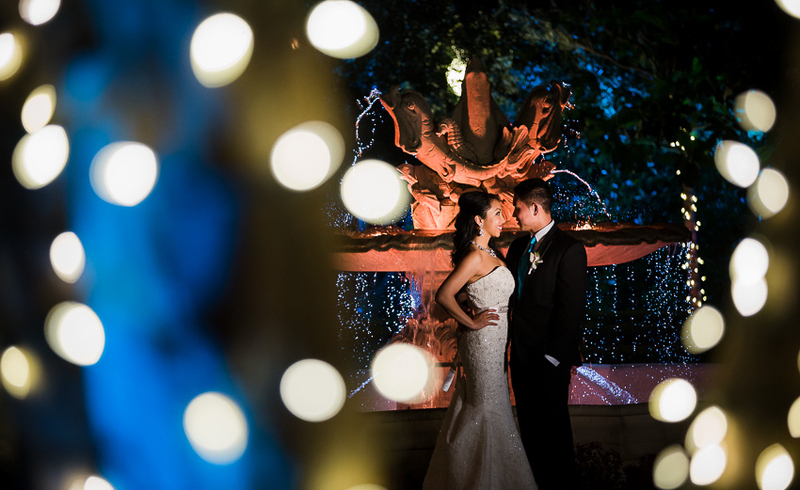 For daytime weddings, our scenic rose garden makes the perfect setting—and for nighttime weddings, our gardens light up in a dreamy glow with our LED lights. 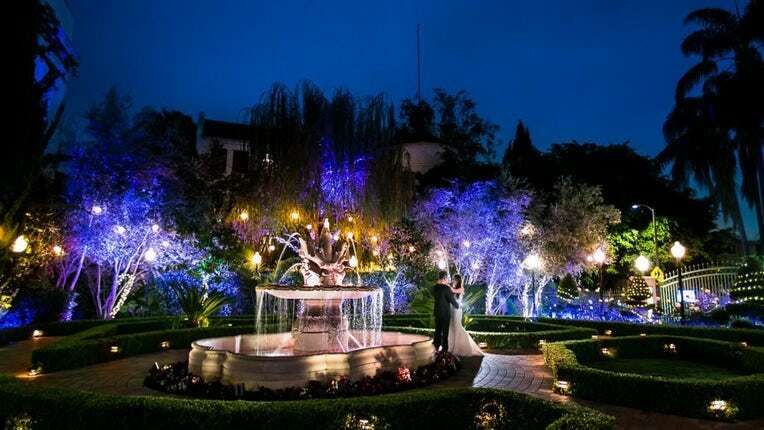 The garden’s magnolia, olive, and cypress trees add to the European-style atmosphere, and truly create a magical ambiance. 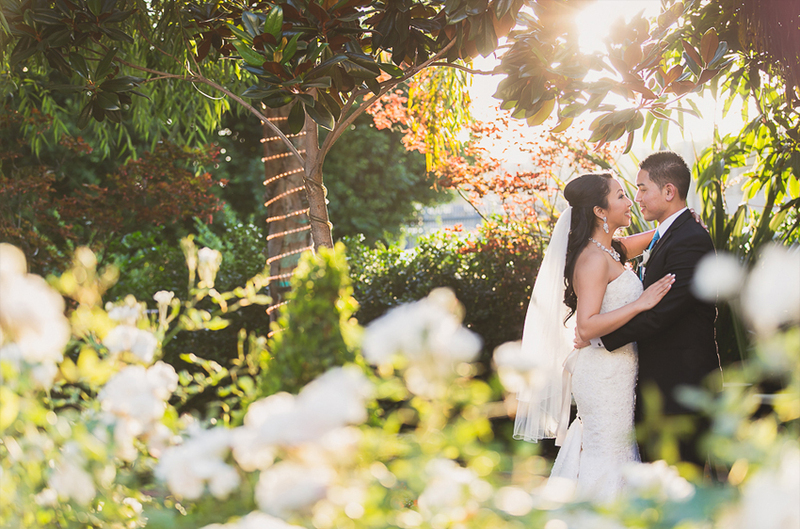 Many couples who do not choose the gardens for their ceremony still take advantage of these stunning surroundings for cocktail hour or portraits, or even their reception. The gardens are a perfect fit for anything! 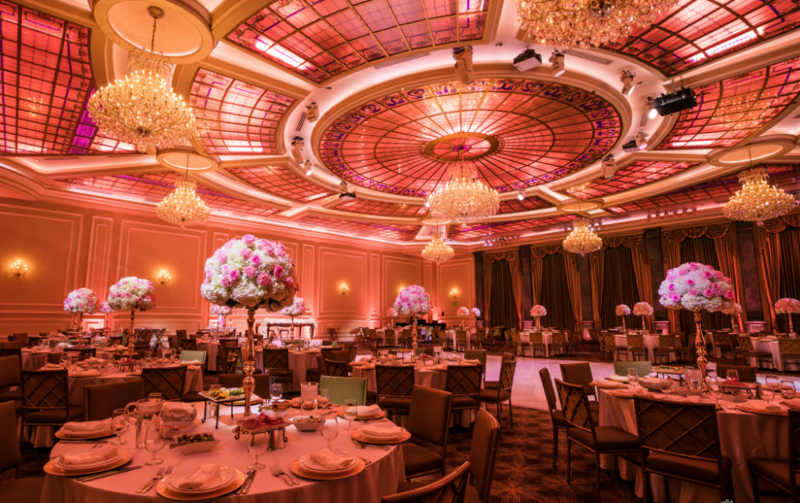 As for a reception that pulls out all the stops, our most notable part of Taglyan is our famous ballroom. 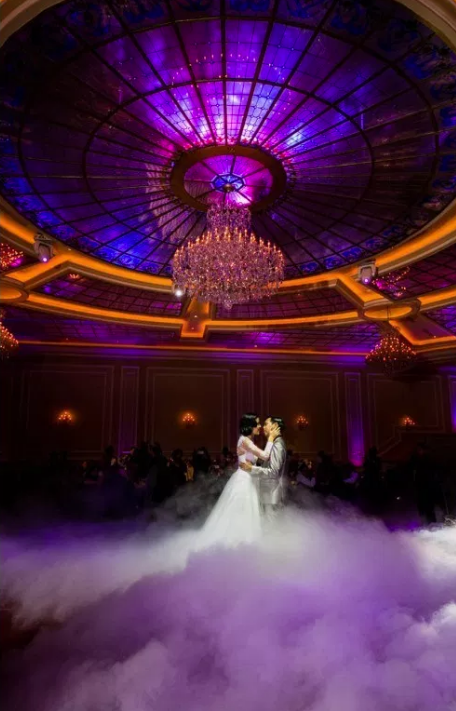 Not only a thing of visual beauty, but also impressive because of its technological amenities, our ballroom far surpasses other Los Angeles wedding venues. Our hand-crafted, one-of-a-kind 5,000 square foot stained glass ceiling offers couples to choose any color of lighting they prefer, and our teardrop crystal chandeliers add a fairytale touch which transforms the room into a dream. 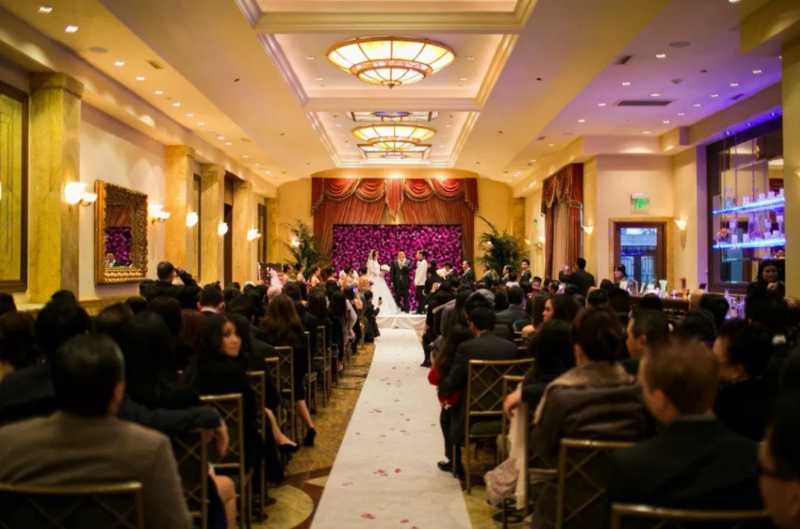 Our ballroom has the unique ability to be both incredibly romantic and an energy-packed party space. In our experience, this is exactly what most couples are looking for in a wedding venue. It may not be a priority for every couple to have all of these options when it comes to their wedding venue, but at Taglyan, we think that those who are starting their life together deserve the best of the best. Having a breathtaking environment to host your closest friends and family on the most important day of your life is priceless. Taglyan is located close by Hollywood and Vine and has become the Tinseltown event space. 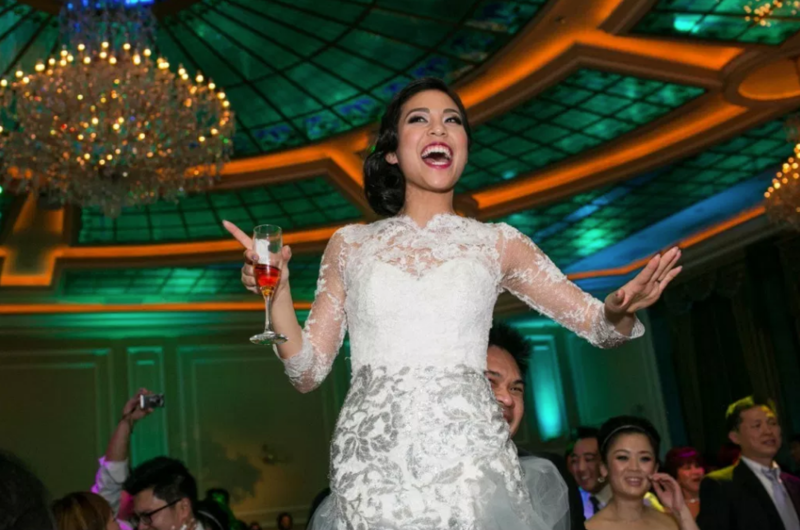 Perfectly suited for glamorous weddings, high-end corporate functions, and wow-factor events of all kinds. If you’re interested in touring our venue in-person or asking us any questions, please feel free to contact us. We would love to speak with you!